One of the overarching truths I’ve learned during my time at Joffe is just how unique each school we partner with is. One reason our school safety consulting programs are effective is because we tailor our recommendations and projects to the existing culture as much as possible. This sort of effort facilitates collaboration instead of confrontation, and has led to successful and safer schools around the country. Now, with all that being said about each school situation being unique...schools share some specific safety challenges and variables that no other group (events, businesses, venues) do. This is particularly important in the context of a school security program. Many of the companies who offer security services to schools do so with guards who also receive other security assignments. That’s fine for them, but we believe there is a fundamental difference in the way you secure a school - operating with compassion, connection, and communication. Joffe guards are only ever assigned to schools, because our security program is narrow in scope. There’s nothing wrong with protecting a mall, but you’ll never find a Joffe guard who does two days in front of the Lids and three in your school’s guard booth. In fact, all of our guards are extensively trained on the issues they may need to deal with on school grounds. That means they attend professional development and skills training in areas such as CPR/First Aid, Search and Rescue, Child Abuse Awareness, Threat Assessment, and more. Of course, they also are trained on details specific to your campus (common trouble spots, entry and exit patterns, the security needs that your staff has noticed). Another problem point security companies face when dealing with schools is size, both in terms of number of clients who they provide security services for and in the amount of guards needed to pull that off. Having a large number of contracted guards is the only way these companies can ensure that someone is always available to cover your campus, but that means faculty and staff often deal with guards who are unfamiliar with your school and thus need additional resources and time from you in order to function. Particularly in a school environment, routines are important. It can be jarring and start the day off on the wrong foot when visitors to your school see a different face every day. I think it is difficult to deny that the security team your school has in place will have a gigantic impact on the culture of your community. They will be the first impression your school makes on visitors, vendors, and everyone in between. They should be a tremendous resource to your campus in a variety of scenarios, large and small. Whether you have security that could stand to be improved, are in the process of determining if on-campus security makes sense for your school, or somewhere else on the path, it will be valuable to think about the type of guards (and the type of company) you want protecting students and staff. We at Joffe certainly wouldn’t claim to know everything, or anywhere close to that. We do know how to hire committed, focused, and cheerful guards who know their stuff, show up on time and in uniform, and are prepped and excited to be a part of your community. More than anything, we know that schools are a security client involving unique challenges and rewards and requiring specific planning just for them. We know that you want guards who know schools. If this article piqued your interest, check out some of our other resources on school security below. Why Hire Outside Security Guards? Want to cut to the chase? 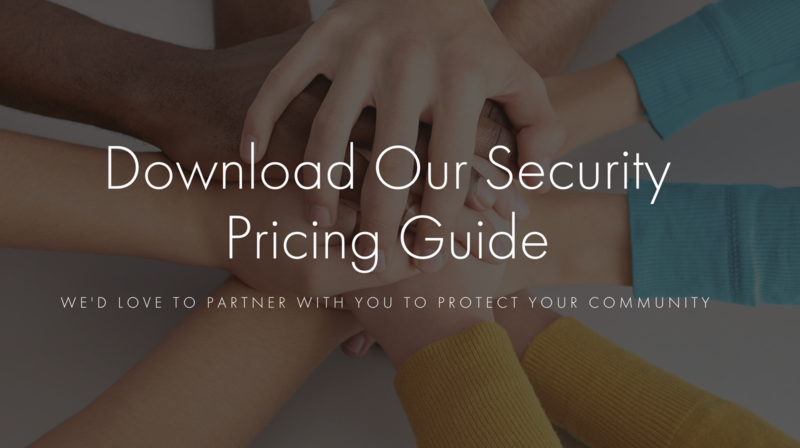 Click the button below to download our security pricing guide.